Synchronize your folders in real time with this handy application that offers creation of customizable tasks for file update or backup. Maintaining a large volume of information and numerous files requires good organizing skills, constant updating and special attention to the folder structure. One way or another, at some point, users might necessitate an efficient solution for keeping their folders and files up to date automatically. 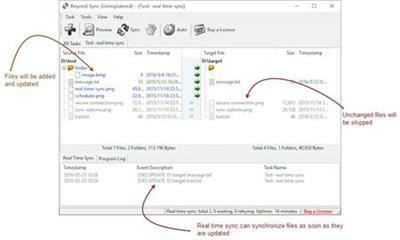 Beyond Sync is a useful utility that was created to help people maintain their content and folders up to date when making changes to their files.